His name is Petey the Penguin. When I first heard about the phenomenon of a surfer Penguin, I just had to go see it for myself. There he was, a child like figure of a bird, riding along the snowy whitecap waves as he merrily waved to his shore audience.....What a sight it was! If you have never experienced arctic blue ice in real life, this is how it is without having to bundle up and explore in -30 degrees below zero or colder. Each of the 28 glass beads in this necklace was made by me, one at a time, in my shop in far northern Wisconsin near the shores of Lake Superior. 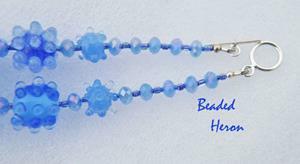 I make the beads using a process called Lampworking, where Rods of clear and colored glass are melted in the flame of a torch, while being wound on a stainless steel rod and then decorated. 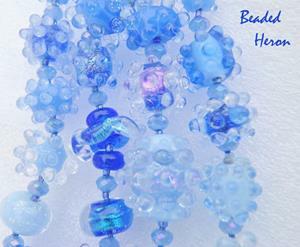 Many of the beads are heavily laden in dichroic glass and then encased, which further magnifies the dichroic sparkle. 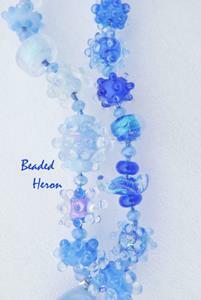 Once this process is completed, the beads go directly into a waiting hot kiln to be properly annealed for some hours. 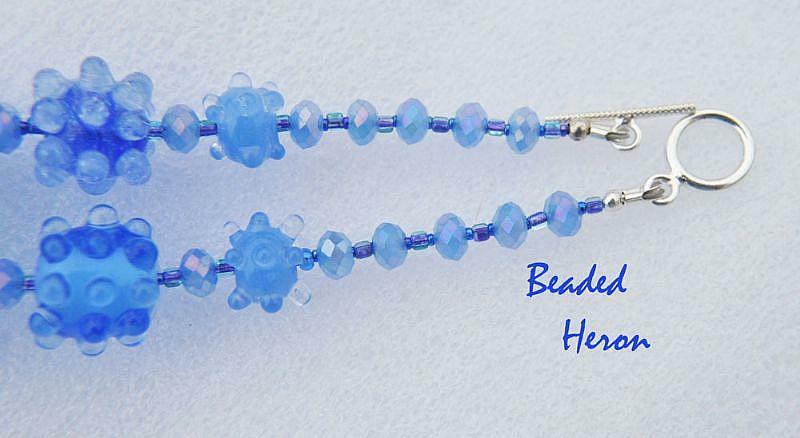 This allows all the little glassy molecules to find their right place and insure the beads will last until the end of time, given proper care. Blue Ice is one of the most beautiful things in the world and I am so lucky to have seen it, and now be able to recreate it in glass. The only thing in this necklace that I haven't seen in real life, is a Penguin, surfing or otherwise...in Lake Superior! I made this necklace as a tribute to my mom, who I lost this Fall. Mom's favorite color was blue and she loved my images of Lake Superior Blue Ice. In between each bead is a crystal AB spacer, from which additional sparkle emerges throughout the piece. If ever there was a word to describe the sparkle that is contained in this necklace, it would be bling. It definitely does describe the phenomenon of arctic blue ice. The necklace is 21 1/2 inches long with a total pendant length of 3 inches. 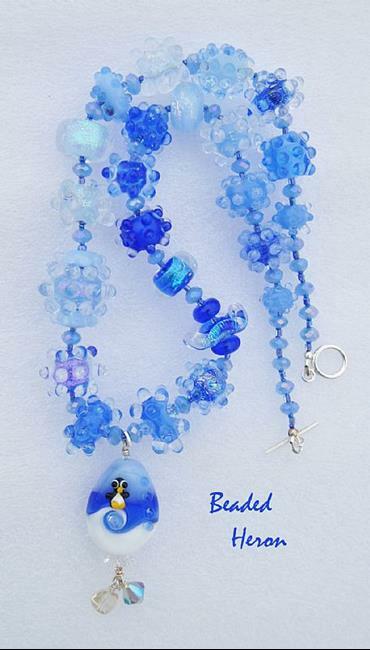 I painstakingly lined all of the beads in this necklace with size 15 seed beads so that none of the stringing medium is in contact with any of the beads or crystals. I also used sterling wire guardians at the sterling toggle closure to insure that this heirloom quality piece stays intact for many years to come. Free insured shipping for within the continental United Stated and Canada is included. For areas outside the United Stated and Canada, please convo me in advance concerning shipping before purchase, thank you. Have a great day and thank you for looking at my new pride and joy!